I never thought that I would be spending time seriously considering the pros and cons of different nappies, nor did I think I would spend time writing about them. But here we are, and here I am… writing. I have a confession to make. I have an unhealthy love of cloth nappies. I’ll admit it. Even from here in Indo I find myself using my slow internet connection to browse second hand (I try not to buy new, but that’s a story for another time) nappy sites and look at the beautiful cloths and dream about Bo’s little toddler bum running around in cloth. I don’t purchase, I just look, and dream. I don’t purchase because Bo has enough cloth. We have thirty something nappies in a big red plastic bin in her corner of our house. 90% of these nappies were gifted to us and the others were bought second hand. We love our cloth. 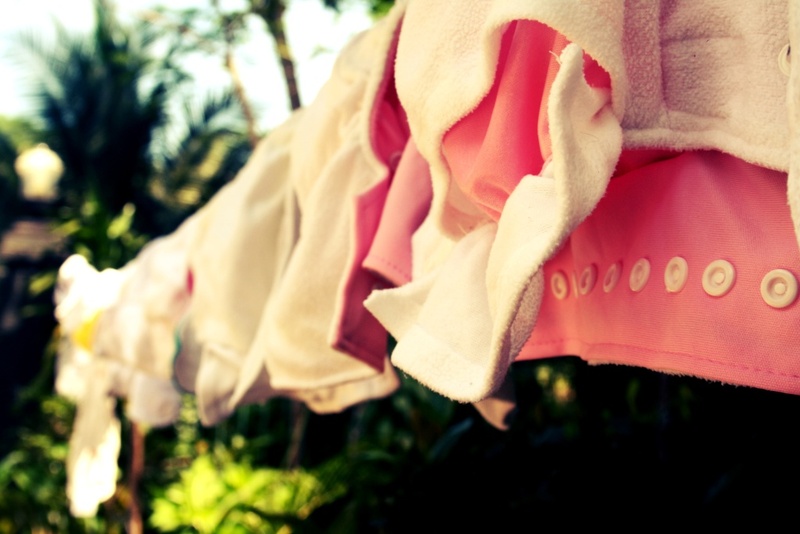 When in Australia we used disposables most of the time… with a brand new first-time-mama baby, a husband overseas and packing for a move… we had enough on our plates, so I “learned” cloth slowly. Once we arrived here in Indo we went cloth, and we are using the last of our disposables just for night time sleeps (they last a super long time when you are only using 1 or 2 a day!). I read a lot about cloth diapering before we started the cloth adventure. I joined MCN (Modern Cloth Nappy) forums and found out how to wash, care for and use cloth diapers of all makes and models – and you may find it hard to imagine, but there are a few. We have our favourites. We love Itti Bittis and Designer Bums… but the China Cheapies we have are really just as reliable and Bo couldn’t care less which one we put on her. My husband loves them, I love them, they don’t leak, they don’t smell, they look cute and they are super easy to use and to wash.
Good for our pocket. Good for our environment. Good for Bo’s bum. And now we have our semi-automatic (yes that means it’s part manual) washing machine and we don’t have to handwash… there is no reason not to go green and use cloth. When nappies are $40 a box in stores… it’s definitely something worth considering when thinking about your babies bottom. Sarah - MCNs are the best sort of nappy ever! Who can resist a little bum covered in fluffy cloth? ?